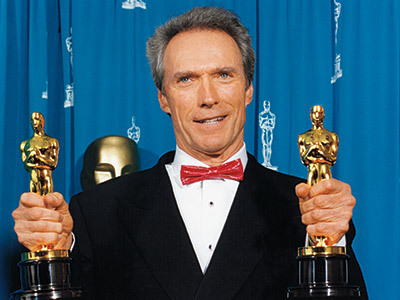 While I'm not speeding through it like Arnold's Total Recall, I'm 500 pages into the "warts and all biography" on screen legend Clint Eastwood, The Life and Legend, by Patrick McGilligan. 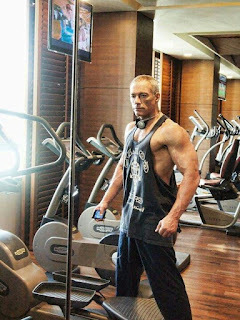 For the most part you gather that Clint likes to keep fit, pal around with macho dudes, changes friends and professional colleagues every few years, loves the ladies but never really wanted kids and really likes saving money. 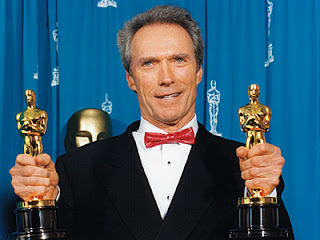 There's great and shocking stories aplenty like the time Clint ran his truck into a car parked in his space when there were another 5 open or the time he locked out live in ladyfriend Sandra Locke and put all her stuff into boxes in the driveway. She would sue him later and settle. 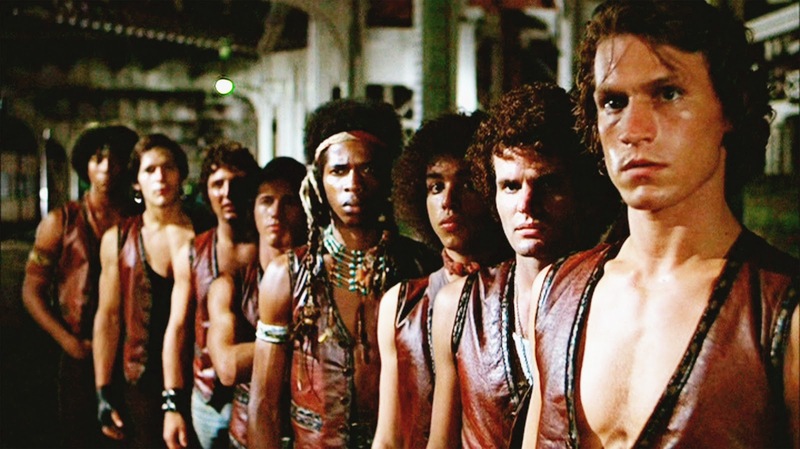 The Warriors is one of my favorite films of all time. Like Big Trouble In Little China, I first discovered the film on late night TV. But instead of TBS it was Joe Bob Brigg's Drive In on TNT. 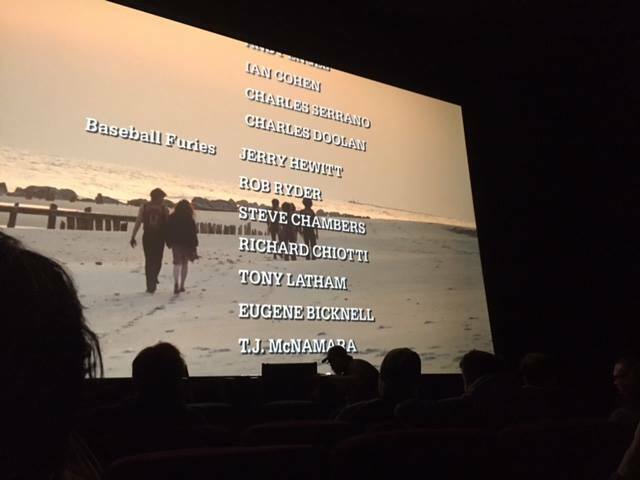 A friend's dad recognized the film, having seen it upon release in 1979. Soon a VHS copy was on repeat and I realized the TV version had additional scenes not featured in the theatrical. I loved the flick so much that middle school me found Sol Yurick's source novel from a neighboring library who then sent it to my local branch. It's not a long novel but I figured on reading it in a few chunks. After many a page, the book did not resemble the finished film much at all so I kept reading, waiting for the fight and chase scenes so prevalent in the film, to happen. They never did. 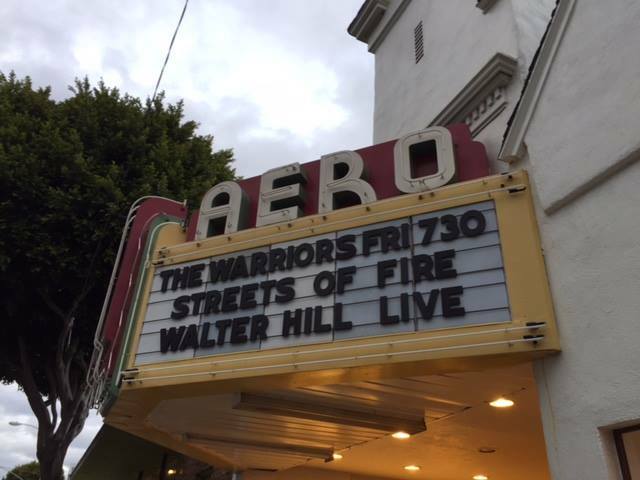 Years later on the special edition DVD, writer/director Walter Hill mentioned being inspired by the Xenophon's Greek tale Anabasis where an army of soldiers are stuck deep in enemy territory and march their way back to the ocean. I found a copy of the text on Google and read that tome years ago. Back in 2011 Edgar Wright hosted a screening of The Warriors where producers Lawrence Gordon and Frank Marshall along with actor James Remar and Hill attended. 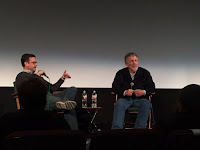 Cut to this weekend and The American Cinematheque's Aero Theatre was hosting a retrospective of the acclaimed filmmaker to celebrate the premiere of his latest work, The Assignment. On Friday night we hit newly renovated Margo's on Montana for Happy Hour (fantastic burger, fries and mussels) and headed over to the show. We were walking behind a small group and I realized one of them was Ajax himself, James Remar! Tied with Swan, Ajax was my favorite Warrior and part of my first e-mail address on Yahoo. The group was taking a picture with the marquee so I volunteered to take one of all of them then told Remar he was my favorite Warrior to which he was very gracious and a little surprised I recognized him. A terrific character actor, Remar has been many a Walter Hill film, was the original Hicks before being replaced by Michael Biehn, The Phantom, Mortal Kombat: Annihilation and oh so many more. If I had more time I would have asked him about being directed by Jean-Claude Van Damme in The Quest! Once the theater filled up though, Remar was inconspicuous no more. Apaprently Wesley Snipes, star of Hill's prison boxing flick Undisputed was in the audience as well! From the opening shot of Coney Island's Wonder Wheel with Barry De Vorzon's mood setting synth enhanced music, The Warriors is still as iconic and awesome as ever. Hill's bread and butter has always been creating a comic book fever dream world; Hard Times, The Driver, The Warriors and Streets of Fire are all ample examples of that. The outlandish make up and costumes, the gang meet up and ensuing pandemonium after would be street soldier general Cyrus is murdered by the squirrelly Luthor (David Patrick Kelly) who then frames The Warriors, causing them to bop their way back to Coney Island with every gang in the city on their tails, is thrilling, funny and inspiring. As a kid I wanted to be cool like Swan, warlord of the The Warriors played by the steadfast Michael Beck who deserved much more of a career afterwards. Or brash like Remar's Ajax who's always looking to fight or find some chicks aka strange wool. The personalities of the gangs is still strong, the fights and chases still kinetic and the shot on the streets of New York aesthetic still impressive. After the film, Walter Hill received a standing ovation before taking part in a bit of a quiet Q&A. 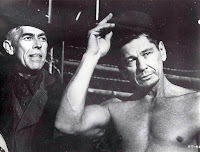 Hill discussed how the film was set up after another fell apart and owing much of his career to producer Lawrence Gordon. He commended the young, unknown cast for being in top shape, enduring a hard shoot but never complaining. 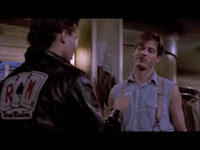 Shot mostly at night, the film was behind schedule nearly immediately and studio Paramount was not happy with the results, thinking this "New York youth movie" would be similar to their hit Saturday Night Fever. Remar was nearly blown up during the car explosion scene and Hill joked he should have sued the studio for millions but probably settled for $50 from Frank Marshall. Hill also spoke about the recently deceased Bill Paxton (View In Peace), saying he truly was a great guy and a great friend who could pick up where you left off even after not seeing each other for a year. On his carte blanche financial flop Streets of Fire, Hill spoke about making it a musical with action and guns to change things up and how Edward James Olmos came in to read for the sidekick role and said it was a poorly written Latino stereotype. Hill didn't disagree and when Amy Madigan came in, said the McCoy role was the best in the film and suggested rewriting it as a woman to create a new angle, thus creating arguably the most scene stealing role in the beautifully crafted, understated love story masquerading as an action film with a truly outstanding soundtrack. I also love the costumes with their emphasis on suspenders. When asked about the potential sequels mentioned in the script, The Far City and Cody's Return, Hill responded it was simply a matter of enticing the studio to make the film since they're always looking for franchises. Even though he had absolutely no ideas for sequels but it was his job to come up with stories. Aside from an excellent exhibit floor, WonderCon had several panels every hour and we ended up attending several on Friday and Saturday. On Friday we checked out a session on the pre-visualization of hit Wolverine movie Logan where guests discussed creating a non-superhero movie starring superheroes and how writer/director James Mangold pushed them to "make it real". Which is kind of weird when you think of it since the dude has a metal skeleton and another guy can control people with his mind but whatever. It did push the crew to be more creative and not fall back on tired tropes or exaggerated action sequences with lots of explosions. After that it was a celebration of Buffy and Angel to celebrate 20 years with a preview of an upcoming oral history book from genre writer and super fan Mark A. Altman and Edward Gross. This was a fun panel as the two talked about how they ended up writing a book on Buffy (their publisher wanted another book after their Star Trek themed oral history, anniversary was coming, one of their favorite shows) and the good old days of genre journalism of the 80's and 90's with Fangoria, Starlog, Cinefantastique and Cinescape. Gross told a funny story about looking up Joss Whedon and calling him and the young writer being so thankful of the early support. In the years to come, Whedon would make himself available to Gross for hours at a time for interviews but when Whedon landed The Avengers, the accessibility ended. The Arena was pretty quiet and media presence was limited in general with only Warner Brothers putting on a studio panel that filled up quick as Annabelle 2 and Wonder Woman were previewed. But the cast and crew of Archie showed up to a full house with Luke Perry looking very scruffy and not knowing how to handle social media while the kid who plays Archie started talking and freaked everyone out. Turns out he's from New Zealand and has the accent too boot. Jim Lee's WildStorm celebrated 25 years with a large panel of artists, writers, inkers and contributors. Highlight tidbits included learning that Lee now has 9 kids from two wives and that WS started off in a one bedroom apartment, then two bedrooms then an actual studio in a bank building. Lee and long time inker Scott Williams argued about who would pay for the fax machine and realized they needed assistants and finance people to actual run a company. It was a very familial atmosphere as Lee encouraged young artists to strive and become the next themselves, not a copy of him. Many were away from home for the first time and lived in a nice apartment in a nice part of town that was soon trashed and dubbed the "Crack house". Lee helped the young guys with money, buying cars, bailed them out of jail and to save time, hired someone to come in and cut all of their hair at the same time. Apparently they all got sweet bowl cuts. There was mention of Brett Booth who unfortunately couldn't attend, Damme it! I asked Lee if between WildCats toys, a video game and animated series if a film was ever seriously considered. He responded that it never got past the pitch stage and it would have just been too big a project for the pre-X-Men and Spider-Man era. We caught the tail end of Valiant's panel on digital offerings that includes a Ninjak web series then sat in for the Street Fighter 30th Anniversary. Cleaned up versions of old games are on the way as well as additional upgrades to latest release Street Fighter V. E-gaming league, the Capcom Cup is also in full swing with hundreds of thousands of dollars up for grabs. I'd love to check one of these events some day to see some bitching gameplay and epic smack talk. After the show Saturday we met up with a friend to hit 2084 Arcade, an Anaheim original where several game owners open up their warehouse of 80+ games to the public. There's a $10 cover charge but all games are on free play, there's a couple of consoles upstairs, giant Jenga and a fridge full of waters. You know I'm a sucker for arcade games but had recently sated my appetite during a weekend in Fullerton which boasts not one but two button mashing destinations. One of them even had my holy grail of games, Capcom's Alien Vs Predator brawler! But I'd never been to 2084, we were in the neighborhood and they're only open a couple of times a month so we had to go. The place is jam packed with cabinets but more than that the ambiance is killer with lasers, music and videos projecting against the walls. 80's games aren't really my favorites though, I'm more of a 90's action guy but I tried my skills at Missile Command, The Empire Strikes Back, Punch Out and several other obscure titles. It was a bit crowded so we didn't stay long but one more spot I can check off my list of arcades for grown ups in the modern age. Some abs or planks and cardio followed each and I felt a lot better about the not great eating choices I'd have to make the rest of the day. And like Jean-Claude Van Damme believes, the only bad workout is the one you don't do, so keep pumping! After that tremendous Thursday of Extreme Studios anniversary, Irish pub happy hour and a quick trip to Disneyland's California Adventure Park, it was time to start the WonderCon! With badges being mailed out early, we breezed past a giant line waiting to pick up their badges outside. Inside, I had the immediate sense that the show was bigger than years prior and I think I'm right. For 2017, WonderCon was utilizing all four Halls A-D for registration, Arena queue and the actual exhibit floor. Compared to the first or second year where we shared with a large volleyball tournament which lead to some amusing co-mingling of athletes and cosplayers outside. While there weren't any huge installations or Hollywood showpieces, DC, Boom, Gold & Silver Age Comics, a pink unicorn looking thing, a sizable Artist Alley, Disney and Capcom were are all out in force. Walking around for several hours, I realized we'd barely covered half the floor! There was a solid mix of comic books, action figures, Funko Pops, art pieces, mystery boxes, prints, movie posters and film soundtracks. For the older goer you had 50's and 60's Disney pieces or a frigging oil paint by numbers set featuring James frigging Garner as Maverick! 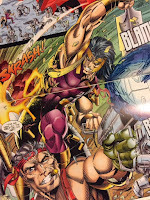 With a Wild Storm 25th anniversary panel scheduled and Jim Lee being a guest of honor, I was hoping there would be some sweet 90's Image stuff and for the most part I was not disappointed. One booth had WildCats figures for $15-20 a pop while another had a beat up in package Zealot for $4, sold! On the hunt for a McFarlane Toys Shaft or Dutch figure from Youngblood but only saw the likes of Troll or Badrock, hello Amazon! Big Red Comics and another vendor had some sweet $1 bins, bagged, boarded and in alphabetical order. Capcom had an awesome four sided installation with multiple Street Fighter games to play as it's the 30th anniversary but on one side was a real highlight, a faux bedroom decked out in 90's glory i.e. Michael Jordan and Home Alone posters along with tube TV's to play Ducktales or Chip N' Dale Rescue Rangers! To top it off, you got a snap bracelet on the way out, 90's forever! On the new trinkets front, I grabbed some custom Cyclops and Captain America zipper pulls along with a bottle opener with Ron Lim Cap art. Cosplay wise you had Game of Thrones in groups, much Star Wars, stilted Transformers and Voltron and one Jack Frost. While there were huge walkways in some of the hall, over in A things got narrow and crowded, cheaper real estate? Hand crafted hats, belts, phone cases and the like were on display along with prop weapons and real knives. Flash Gordon's Sam Jones was the most recognizable actor selling autographs. While there were a dozen food trucks outside, concession stands inside had surprisingly decent sustenance with usual offerings like pizza, deli sammiches, burgers and soft serve ice cream but no bars on the floor. All in, the best WonderCon floor I can think of in recent memory. This past weekend, Comic-Con International's WonderCon returned to Anaheim after a brief stint in Los Angeles last year. Anaheim is great site for hosting cons due to it's proximity to Disneyland that provides a fantastic infrastructure of highways, roads, hotels and eateries. Even though the show started on Friday, we booked a suite at the Double Tree (gotta love WC pricing!) on Thursday so we could hit Disneyland before all the Spring Breakers showed up. 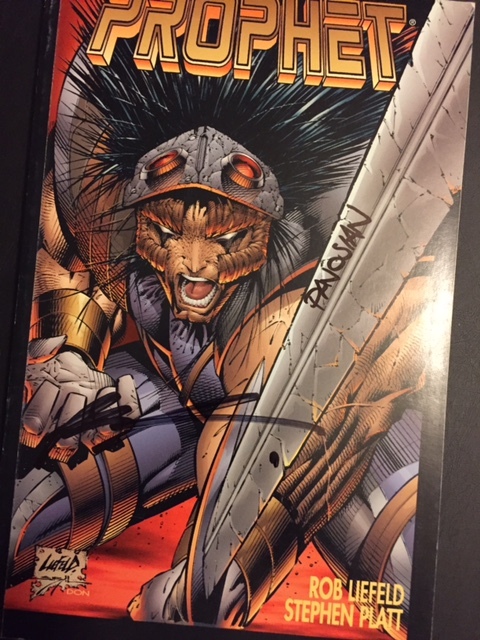 A random Facebook post alerted me of something truly comic book distinct, a 25th anniversary signing of Rob Liefeld's Image Comics imprint Extreme Studios! 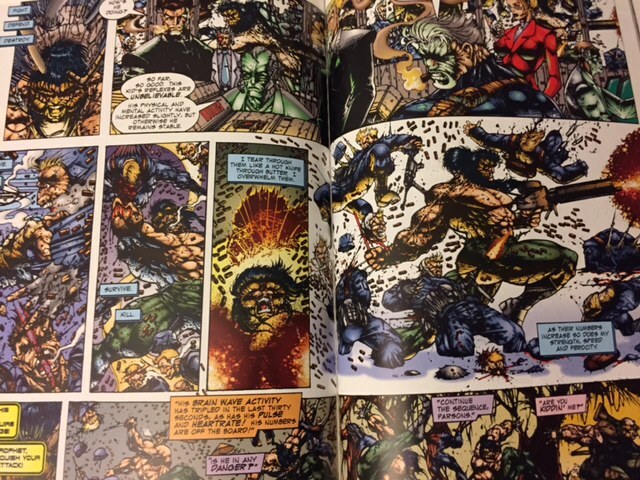 Liefeld and Jim Lee's WildStorm studios were the two Image brands I grew up on with multiple runs of Extreme's Youngblood, Brigade and Prophet being part of my collections around the country. I had just purchased the new hardcover edition of Youngblood (forgot to bring it) and was brought back to the 90's in your face showcase of muscles, exposed hair, hot bodies and being superheroes in a media obsessed society. Big Red Comics is located in picturesque old town Orange complete with roundabout and multiple eateries, bars and antique shops. There was already a line down the block but store staff walked the queue explaining how things were going to work. 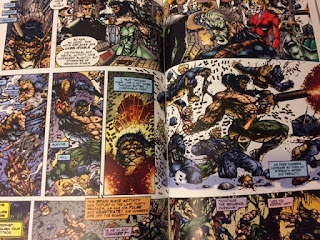 Once inside, you could buy an Extreme Yearbook with bios and artwork from all of the guests along with other titles and rarities like store only Youngblood #1 or Prophet graphic novels collecting the first seven issues. More and more guests showed up and raffles kept the atmosphere light. The guest list was IMMENSE with Jeff Matsuda, Dan Fraga, Andy Park, Shannon Denton, Chap Yaep, Todd Nauck, Marat Mychaels, Norm Rapmund, Art Thibert, Danny Miki, Matt Hawkins, Dan Panosian, Shelby Robertson, Jon Sibal and Karl Altstaetter. I had already had a brief fanboy moment with Prophet's Dan Panosian at February's Long Beach Con so it was cool when he walked up next to us in line and sighed about Los Angeles traffic making him late. The signing was kind of what you made of it, chit chatting with each guest, I wish I had read the yearbook before meeting everyone! But stories of being 19 when they joined and it mostly being a blur or talking animated X-Men as someone moved into film and TV after comics. Panosian said there would be an anniversary panel at San Diego Comic-Con as there wasn't one at WC while I talked to Matt Hawkins about The Image Revolution being the best documentary of the four he did interviews for. 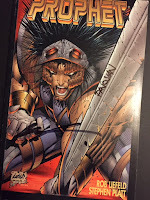 Rob Liefeld was gracious, thanking us for showing up and waiting, ready to sign whatever I wanted. He flipped through the Prophet trade, laughing that he found a box of them so they were vintage! To cap off a great event, O'Hara's Pub next door had $6 Jameson's...and we still had Disneyland later that evening. Wonder Con 2017 was shaping up nicely and it hadn't even started. Back in 1999, I saw Fight Club in my hometown's second run theater and it immediately had an impact on my life. I went out and bought the book (movie is better), devoured articles about the film (it's an allegory for Calvin and Hobbes? Mind blowing!) and went through many of the special features when a loaded DVD edition dropped (Brad Pitt and Edward Norton make fun of a Jean-Claude Van Damme action sequence involving doing the splits to avoid a projectile). After all the negative press (Columbine-era, violence) the $60 million experimental flick brought in a tepid $37 million in theaters but became one of Fox's most sold DVD's, moving 6 million copies and grossing an additional $55 million. 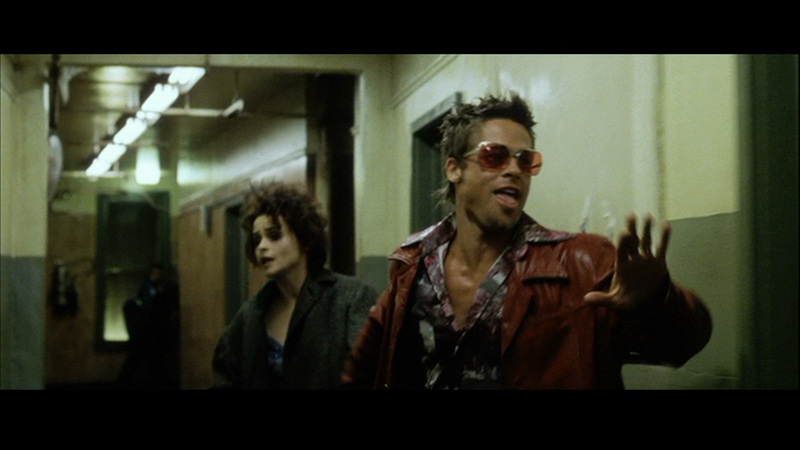 Legions of college kids would be inspired by Tyler Durden's aloof yet cool guy style for better or for worse and the dark sense of humor, twist ending along with computer enhanced visuals made it a title that was unique for it's time in a year that saw additional titles challenge mainstream cinema with arthouse sensibilities like The Matrix, Being John Malkovich or Three Kings. Watching it all these years later, the film still holds up. Sure the visual f/x shots moving through a trash can look sleek but weak in the modern age but Pitt and Norton's performance as weirdos who challenge social norms in a dark search for self and love through soap, mayhem and violence are as effective as ever. 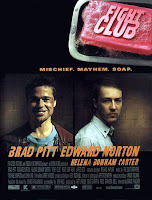 David Fincher is at his nuanced, atmospheric best with the stark yet dark look and feel, the Dust Brothers soundtrack and twisted sense of humor from Chuck Palahniuk's novel and Jim Uhl's script. And of course, Brad Pitt as the scuzzy yet funny yet statuesque Durden would become and still is a highlight in his filmography.